Nancy Donnelly studied flute with Alison Hubbard and earned her Bachelor’s Degree in Music Therapy from the New School of Social Research in New York, N.Y. She has played the flute for 38 years, and regularly performs for a variety of special events. Some of the places she’s played in St. Louis include the Sheldon Concert Hall, St. Louis Art Museum, columbia Foundation for the Arts, Kemper Art Museum, and she even played The National Anthem at Busch Stadium with the St. Louis Flute Society. She also gives lessons. 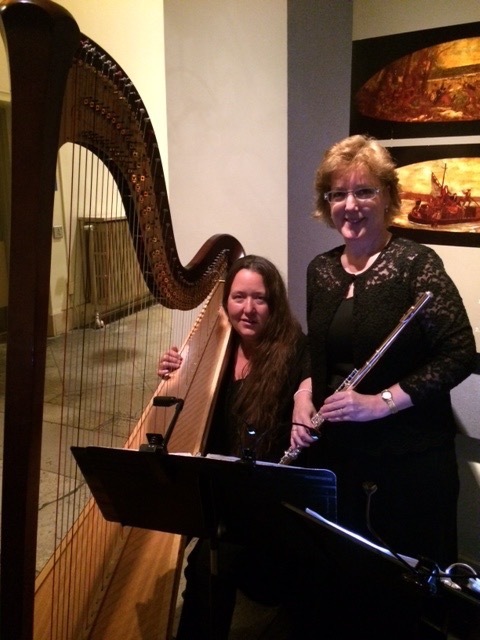 Nancy & I have been playing together for many years, and we play everything from Classical music to Classic rock, and for larger venues, such as the St. Louis Art Museum, we can crank up the volume with Electric Harp & Electrified Flute! In the photo above, we were playing for an event at the Old Courthouse in downtown St. Louis.